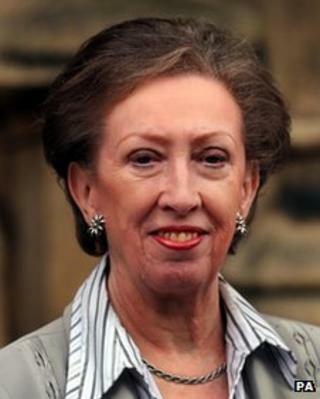 Veteran MP Margaret Beckett has been made a Dame on the New Year Honours list in recognition of a parliamentary career spanning almost 40 years. The 69-year-old served under four prime ministers and became Britain's first female foreign secretary. There is also a knighthood for veteran Conservative MP Richard Shepherd. The award of honours to politicians for public service was criticised by a Commons committee earlier in the year amid calls for a more transparency. The Commons Public Administration Committee said the honours process had become overly "politicised" and this risked undermining public confidence. It said more needed to be done to show that recipients working in politics were deserving of special recognition, it added. This followed criticism of the award of knighthoods to a number of ministers who were sacked in September's government reshuffle. The committee urged the prime minister to consult more widely before putting forward names for consideration by the independent honours committee. Dame Margaret Beckett, who has been recognised for her public and political service, said the award was for "all the work I've been able to be part of in politics, which is greatly appreciated". Now MP for Derby South, she was first elected to Parliament in 1974, serving as a junior education minister under former Labour Prime Minister James Callaghan. She lost her seat at the 1979 election, only to return to the Commons in 1983. She served as deputy Labour leader in opposition and briefly became Labour leader after the death of John Smith in 1994. She then held a series of Cabinet posts under Tony Blair between 1997 and 2007, latterly as the UK's first female foreign secretary. Angela Watkinson, Conservative MP for Hornchurch and Upminster in east London, also becomes a Dame in recognition of her public and political service. Sir Richard, MP for Aldridge Brownhills, is knighted for public service. He has sat in the House of Commons since 1979 and although he has never served in government, he is widely respected for his commitment to Parliament, independence of mind and effectiveness as a backbencher. Mr Shepherd was one of number of Conservative MPs who opposed the ratification of the Maastricht Treaty in the early 1990s and openly challenged the administration of John Major in successive votes over the future of the EU. He had the whip taken away for four months in 1994 after defying the government in Parliament. Among other elected politicians to be recognised is former Eastenders actor Michael Cashman, Labour member of the European Parliament for the West Midlands and founder of gay rights group Stonewall, who becomes a CBE. A CBE also goes to Roger Williams, Lib Dem MP for Brecon and Radnorshire. Among those made OBEs are Annette Brooke, Lib Dem MP for Mid Dorset and Poole, and Christopher Fraser, who stood down as a Tory MP at the last election. George Kynoch, ex-deputy chair of the Scottish Conservatives and Andrew Wiseman, chair of the Lib Dems Federal Finance Committee, are also similarly honoured while Conservative MEP and businessman Malcolm Harbour becomes a CBE for his services to the UK economy. Caroline Pidgeon, Lib Dem member of the London Assembly, becomes an MBE. Senior public servants also feature in the annual 2013 New Year Honours List. Ursula Brennan, the most senior civil servant in the Ministry of Justice and former top mandarin at the Ministry of Defence, has been named a Dame Commander of the Order of the Bath. Jonathan Evans, the head of MI5 and Robert Rogers, Clerk of the House of Commons, become Knights Commander of the Order of the Bath for services to defence and parliamentary service respectively. Cherie Blair, wife of the former Labour prime minister, is made a CBE for services to charity and women's issues. The way honours for political and public service are considered changed this year. The nominations are initially considered by a nine-member committee, whose members include the chief whip Sir George Young and his Labour and Lib Dem counterparts Rosie Winterton and Alastair Carmichael. The majority of the committee's members are independent of government, with the body chaired by the Conservative peer Lord Spicer. Nominations are then passed onto the main honours committee for final consideration. This body is chaired by Sir Bob Kerslake, head of the UK civil service but independent members are in the majority.